Where is winter? We have no snow. Though the ENSO (El Nino Southern Oscillation) typically gives us a mild winter—this is the most extreme in forty years of Michigan, El Nino tracking. The temperatures are hovering in the mid 40s during the day, some days it’s warmer. If I’d known, I’d have planted chard, and maybe garlic. On warmer days, our bees are out and about, but I have no idea what they’re doing. There’s very little blooming in this odd December weather. I’ve heard that bees enjoy the occasional mid-winter jaunt—out to stretch their wings and to defecate. Like most creatures, they hate to soil the nest. The mild season poses tough questions for us as newbee beekeepers. On one hand, the bees, so far, have not been subjected to the temperature extremes of the past few years. That must be good. On the other, they are out and about and active—potentially increasing their caloric needs. How do we balance this out? It’s like the old question, do you get wetter walking or running in the rain? We were all ready to harvest some honey in October—but it didn’t get cold. We could see the bees out there, still gathering. So we waited and debated. We are in this, for the bees, and honey is a fringe benefit, not the primary objective. Our first inclination was to leave all the honey for the bees during the winter—perhaps to harvest a little in the spring. Our bee group looked at us like we were crazy. Not only was that a waste (in their view), they added that a hive, top-heavy with frozen honey, was a liability for winter survival. That swung us back towards a harvest. All this extra warm time has only compounded our confusion. We have two issues: winter-wrap and harvest. In northern climates, beekeepers have a variety of bee protection measures to keep bees warm (other than carting them off to Florida.) 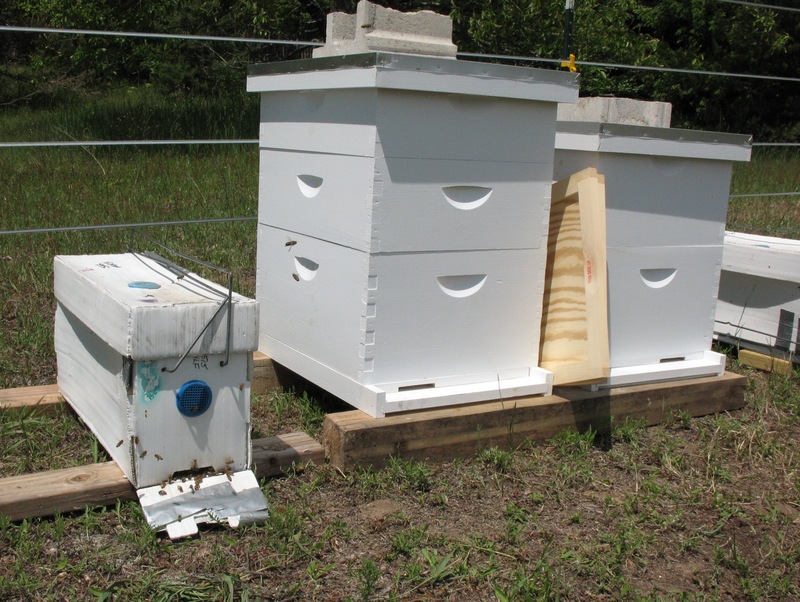 There are simple hive-wraps, insulated hive-wraps, or baffled hive enclosures. Then, there are special feeding formulas, and the debate of the protein/carbohydrate balance suitable for winter nutrition. It’s daunting. The catalogues are full of bee pampering solutions, vitamins and herbal treatments. We shrug. Honey is bee food. We’ll leave them with their honey. After all, our goal was to keep Michigan-hardy bees. 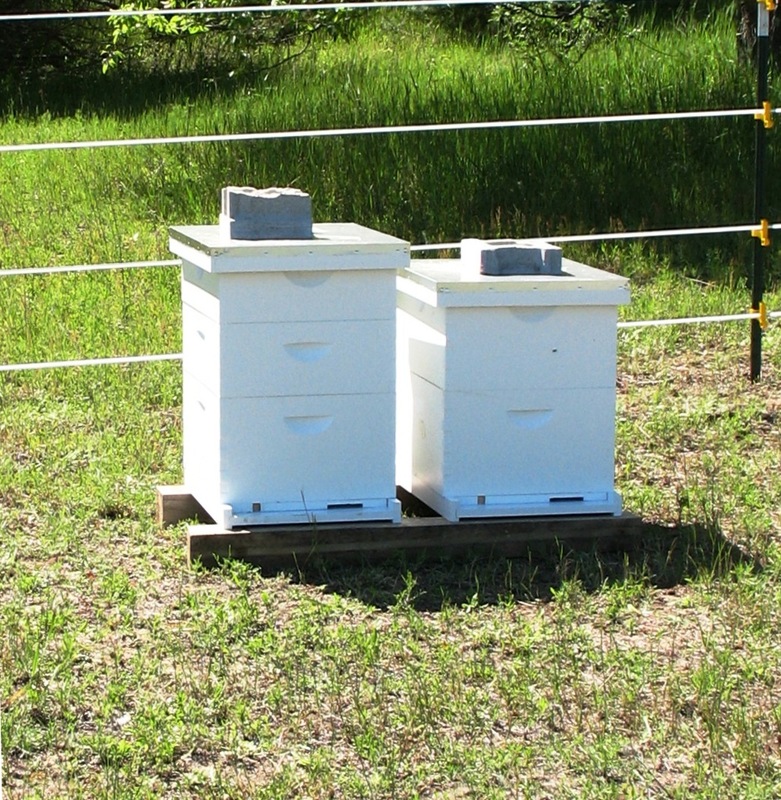 We selected our bees from Michigan over-wintered stock (not those pampered, Florida snowbirds.) We see over-pampering as part of the problem. As for the winter-housing, we do intend to wrap the hives when temperatures fall into the 20s on a regular basis. The biggest issue is to protect them from wind. Bees huddle and give off heat and moisture during the winter. The northern beekeeper must be careful not to impair circulation too much, because trapped moisture can lead to mold and mildew borne bee illnesses. Really, there are almost too many variables! Finally, over the weekend, we did an inspection and took some honey. It was winter-warm—low 50s, so the bees were in slow-active mode. Mostly, they ignored us. At first blush, the hives looked terrible. We know that there is a normal fall die-off—but nothing prepared us for the mound of dead bees on the ground in front of each hive. Oddly, that may be good news. The location of the bee bodies (just below the entry) indicates that bees, dying in the hives, are being tossed out the front door—in a normal, housekeeping kind of way. A true hive collapse has few bodies—since the bees just fly away and die, mysteriously. Our active bees, though slowed by winter, look good. And the scouts are doing their jobs. Both Rick and I received “warning thunks” as we disrupted the hives, but no stinging. We first investigated the two friendlier hives, Niña and Pinta. I’ve been worried about Pinta, since it was the first to slow down, back in October. We have limited experience, so we can only compare the three hives to each other. Pinta seemed listless—and had the most noticeable pile of corpses. But her guards were quick, and the bees inside were clumping in the middle—a good sign. 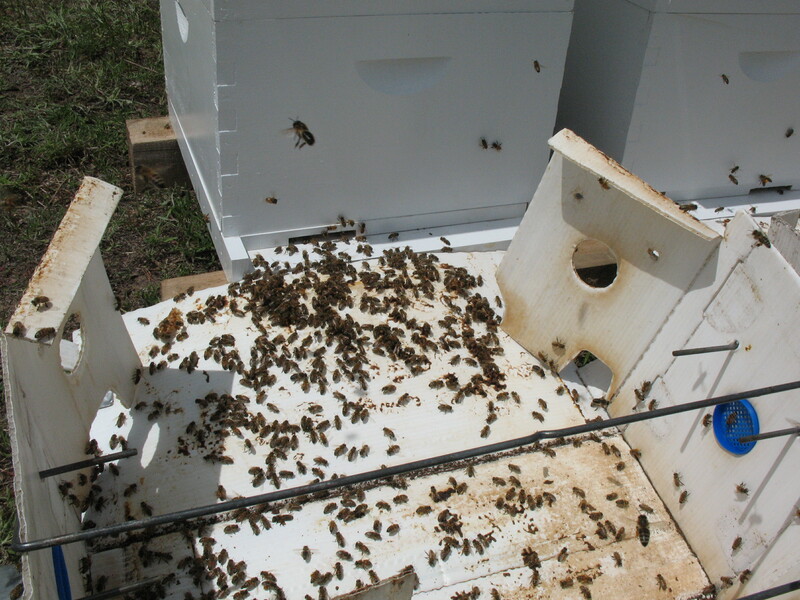 We were disappointed that the top super (a hive box) held only some beeswax comb—no honey. Below, things looked good—plenty of honey and bees. We found the same situation with Niña, the other mild-mannered hive. We decided not to harvest honey from either of them. Maybe we are too conservative, but we’d like our bees to over-winter naturally. This was the hive we were so anxious to trade! We’ll just have to learn to harness that energy, and keep them busy! (I remember parents saying things like that about us as kids. There may be something to it.) With this new appreciation for “busy as a bee,” we closed up the hives and carried off our bounty. Next, we’ll deal with processing. Note: I realize that the recycled photo, above, may give the wrong impression about the mild winter. I didn’t take pics when we harvested honey–so I used one from earlier in the summer. I didn’t think of it until later–but our trees are bare and most of the greenery is gone. They say that a beehive takes on the personality of its queen. That may be a little much, but they are all her children. I don’t know whether there can be a true personality in a critter that has a colony culture. Much of bee activity is driven by pheromones. The queen’s chemical aura both binds the workers to her, and simultaneously suppresses their reproductive systems. They communicate via the famous “bee dance” and with a complicated and primal chemical/olfactory messaging. If you think bees don’t communicate, try disturbing the hive or, more tellingly, mess with one of the scouts. Our bee adventure has had mixed results. At the outset, shortly after “installing” our bees, I became ill. As a result we lost precious time learning to speak ‘bee.’ Our bees had minimal interference for the first 6 to 8 weeks. Sure, we watched their comings and goings, but until I was back on my feet, we didn’t do full hive inspections. Then, we got the third hive. With three, we needed to identify them better so we named them—Niña, Pinta and Santa Maria. Niña was the hive we thought was struggling. When Pinta arrived, it became clear that Niña and Pinta were far more alike, and that Santa Maria, (going gangbusters) was the outlier. Pinta came with a few more bees than Niña—so it was a little more active. That Santa Maria, though, was the New York hub of bee-dom. We even relocated the hives further apart from each other, out of concern that the Santa Maria mob might overwhelm the territory. Other than that, we left them alone to do their bee-thing. It’s fun to watch them, their comings and goings. By careful observation you can see whether they’re coming back to the hive laden with pollen, or empty-handed. While gardening I spent a lot of time observing the bees. People from my bee group warned that there can be hungry times for the bees, between various blooms, even in summer. We saw no such lags. We are really well located to take advantage of several different biomes—forest, open fields, stream habitat and swamp. It seemed something was always blooming. Our intrepid workers were always coming home with saddlebags full of pollen. We’d check, peeking in from time to time, (especially when we had the ant problem) and as the colonies grew we added additional supers on to the stack. Even our little Niña was doing well. It is enormously gratifying to see your own bees pollinating the vegetables in your garden. As we move around the property we keep our ears open for the buzz of pollinators. Sometimes its one of the local native varieties, but often we spy our honeybees out working the fields. There is something peacefully pastoral about the steady work rhythms of the bees. They remind us that “measured and steady” is a template for natural success. Santa Maria, though, is like a hive on steroids. It is what beekeepers call an aggressive hive—and that’s a good thing. Aggressive hives produce far more honey than loafers like Niña and Pinta. Some beekeepers search out aggressive hives for breeding. If we get that far, it’ll be interesting to see how the different hive types do in over-wintering. If we get that far. You see, like some ominous Frankenbee hive, Santa Maria has become a problem. Our bees share the fenced area with the garden and the orchard, or at least Niña and Pinta do. Santa Maria is not so keen on sharing. Twice, I’ve been driven from the garden, stung, because something about my activity alarmed the Santa Maria scouts. Once I was coiling hose. The other time, I was weed-hacking, but not near Santa Maria. Beekeepers learn to expect the occasional bee sting. It goes with the territory. We suit up for working with the bees. The rule of thumb is, suit up and move confidently—without any fast or threatening maneuvers—and you’ll be fine. That is exactly the case with Niña and Pinta. Steady and just a touch of smoke and the bees tolerate an amazing level of interference. But, Santa Maria has me wearing my bee gear to garden! We noticed last week that Santa Maria bees sometimes came from underneath the hive. A cautious peek revealed that there is hive building outside the hive box. That either means that these overly busy bees are building unauthorized honeycomb or, worse yet, that a small offshoot swarm has taken up housekeeping close to the old homestead. Either way, it helped to explain why they are so aggressive in the garden. So, Saturday, we suited-up to investigate. Keeping in mind the general attitude of Santa Maria, it felt like we were arming for war (and it’s a good thing we did.) The objective was to lift and move each of the stacked bee boxes, so that we could flip over the bottom board to get an idea what they were up to, down there. This is a bit of a chore, because at this time of year, when the bees are well stocked with honey, each of these frame boxes can top 70 pounds! (We guess that ours were at about 50.) We got past the first two layers, oohing and ahing at the stores of honey. The bees were well smoked and on alert, but not hostile. 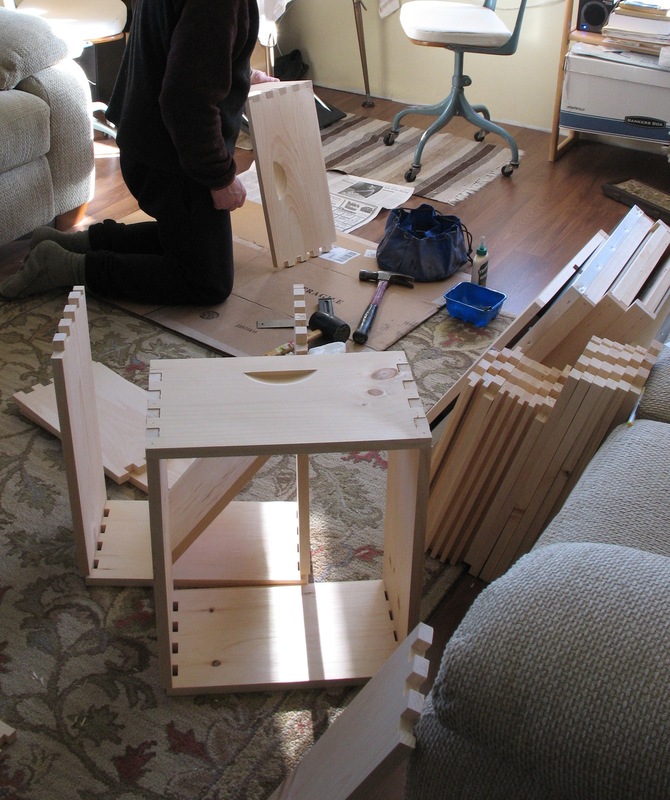 When Rick cracked loose and started to separate the third box, the bees went crazy. Some people are afraid of a “swarm” of bees. A swarm is a relatively gentle bunch. They are in the middle of relocating and they have bigger fish to fry than some human. However, bees pouring out of a hive in defense of their home is a thing to behold. Within seconds I was inundated with bees. We kept our cool, that is, until the bees started stinging me through my jeans. We had agreed, in advance, that in the event of a problem, the stung person would retreat and the remaining person would close up the hive. I retreated—bringing with me a small cloud of angry bees. Once I’d cleared the worst of them off my legs, I went back to help Rick. After all, the retreat didn’t really solve the problem and it wasn’t fair to leave him with the heavy lifting and the defensive smoking at the same time. Ultimately, we just closed the hive back up, but didn’t succeed in checking out the problem under the hive. So, we still have the problem. Tonight is our beekeeping-group meeting. 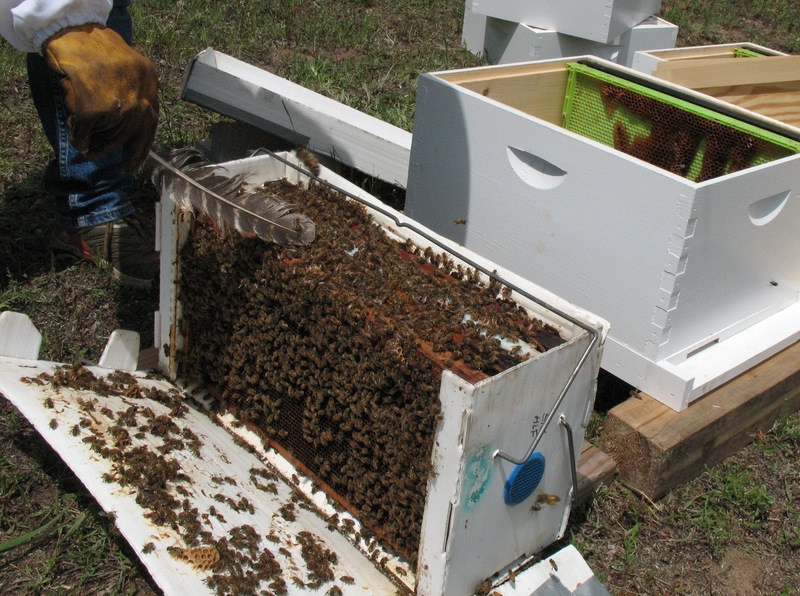 We are eager to get advice, from the more experienced keepers, on how to handle the-hive-on-steroids. For those of the group, who like aggressive bees, we may offer to swap for a kinder, gentler hive. Maybe what we need to do is replace the queen. (“The Queen is dead… Long live the Queen!”) Whatever the solution, we’re ready to gear up, again, (with more layers) and literally, get to the bottom of this problem. Welcome to Michigan. Gardening in California was a formulaic cinch, by comparison. There we had concern about water, and gophers—but there aren’t many insects in California’s parched climate. Of course, we had the flies from the dairy, but they didn’t bother the garden. Gardeners here have to be a hardier lot. There are seasons, with their never-ending uncertainties. We had a late May frost that zapped the blooms, and may cost the region much of its fruit this year. It didn’t affect our garden, because I was too chicken to plant with the night-time temperatures dipping so low. Our starts were safe and snug indoors, by the window. Not that we’ve been without garden trauma. The deer jumped the fence and did all that damage to our fruit trees. The trees are slowly recovering, the pears in the lead and the apples trailing. I think they’ll all survive. Deer are a serious garden hazard. At least we think we’ve ironed out the fence issues with deer. We have gophers, but so far, they haven’t been seen in the garden. Most everything is in buckets (except lettuce and greens—fingers crossed.) Right now we’re trying to figure out how to amend the fence again to keep out the bunnies. We thought we had the spacing right, but somebunny is sneaking in at night and nibbling away at the peppers. Too bad we always have to learn through losses. That’s true for the bugs, too. We’ve lost almost half of the tomatoes to insects. I’ve been out of area so long, I don’t even remember the names of all of the voracious 6-legged predators. Some kind of leaf-hopper-thingie is chewing through the tomato stems. One solution seems to be that our starts need to be bigger before we set them out. The larger ones have not been munched by bugs. Alternatively, we are considering floating row covers, which will outwit the bugs, and give us some frost protection, too. We lost some squash to cutworms—not a crisis, but the tomatoes came as a shock. In California, nothing touches the tomatoes. Here, it’s a race between the bugs and the bunnies. The bugs are after us, too. Black flies, mosquitoes and deer flies. We’re sitting ducks out there. The worst are the black flies. Thank God they have a pretty short season and should be gone by July. We mixed up a concoction of vinegar, water and vanilla, which seems to keep most of the bugs at bay. Before we found that, we were swollen and itchy—to the point of under-the-weather. My father used to shake his head at scant summer clothes. As teens, we ran around in cut-offs and tank tops, oblivious to the hazards. Between the summer sun and the bugs, you were toast. Now, I dress like Dad, long sleeve tees, jeans, a neckerchief and a hat. Sometimes older is wiser. Even our bees are plagued by bugs! Of our three hives, one has always been a little vulnerable. The ants have discovered the weakness, and are trying to set up shop in the top of their hive. Several times a day, I interrupt their efforts, and squish every single ant that doesn’t move faster than me. There are thousands of them. Rick has a plan for ant-wells*. We’ll get the supplies on our next town run and then we’ll foil those ants! * hive stand legs in sheltered oil moats. More on that later. I read all the science on it, and I find it frustrating that there is no consensus about just what is up with the bees. I’ve been a bee fancier for decades. My grandfather was a beekeeper and my interest was piqued as a little kid. However, my urban life didn’t favor beekeeping. When I finally moved to the country, in Two Rock, I was more than ready to keep bees. Then, I learned that my landlord was wildly allergic to bee stings. I liked the landlord—so, no bees. Even going back two decades, the bees were in trouble. The culprits then were tracheal mites and varroa mites. These mites are still a problem for the bees but, in an otherwise healthy hive, a manageable problem. Now we have what’s called Colony Collapse Disorder, with bee losses ranging from 25 to 50%, per year. They just fly away and abandon the hive, en masse. Science has yet to find the reason that the bees lose their sense of direction and wander off to die. In fact, it’s likely there are several reasons. We really are at a point where bees are at risk—and with them a substantial percentage of our food supply. One-third of what we eat requires bee involvement. When North Americans think of our bees, they are generally European honeybees. They have been domesticated for thousands of years—and we brought them with us to America. They are not “natural” to our North American biome, but they are a vital component of our agriculture. There are plenty of native pollinators, but they’re not a big part of the way America produces food. And, that’s a very big part of the problem. It seems to be lost on Big Ag that bees are insects, just like many of the other agricultural “pests.” Our industrial agricultural model—based on monoculture, is hostile to most insects and weeds. The dominant approach is to saturate the crops, and the fields, with poisons. There is an enormous “collateral damage” quotient in the dominant approach. Our foods are coated in pesticide residues, our soil and groundwater are being contaminated, our agricultural workers suffer from chronic exposure syndromes and we poison the bees, our pollinators. Some newer pesticides, neonicitinoids, appear to be particularly damaging to bee populations. Unfortunately, while the bees are dying, the “debate” continues whether the neonicitinoids are legitimate suspects. The makers of these toxins, Bayer and Syngenta, claim that proper use will not result in bee losses—taking a page from the tobacco companies’ old playbook on what does or doesn’t cause lung cancer. Denial can hold truth at bay for decades. After all, there are a great many factors at work. Included in the mix are issues of proper beekeeping. The emphasis for professional beekeepers tends to fall into one of two camps—the pollinators and the honey producers—though the pollinators produce honey, and the honey folks’ bees are obviously out there pollinating, too. Both camps are guilty of not taking great care of their bees. Here, the big issues seem to be food and travel. Like most of us, bees are healthiest if they have a diverse diet and a low stress lifestyle. Left to their own devices, bees will collect the nectar and pollen from of a variety of plants and will produce more than enough honey to feed the hive through the winter. The pollination industry interferes with the natural order by trucking the bees from place to place to pollinate specific crops. There is no diet diversity, the bees are exposed to high levels of insecticides on the crops they pollinate, and living on the road is hard on the bees’ navigation skills. Every single day I am solicited online for donations to “save the bees.” Most of these are seeking funds to fight the use of neonicitinoids which really are a big problem, but only a part of the problem. 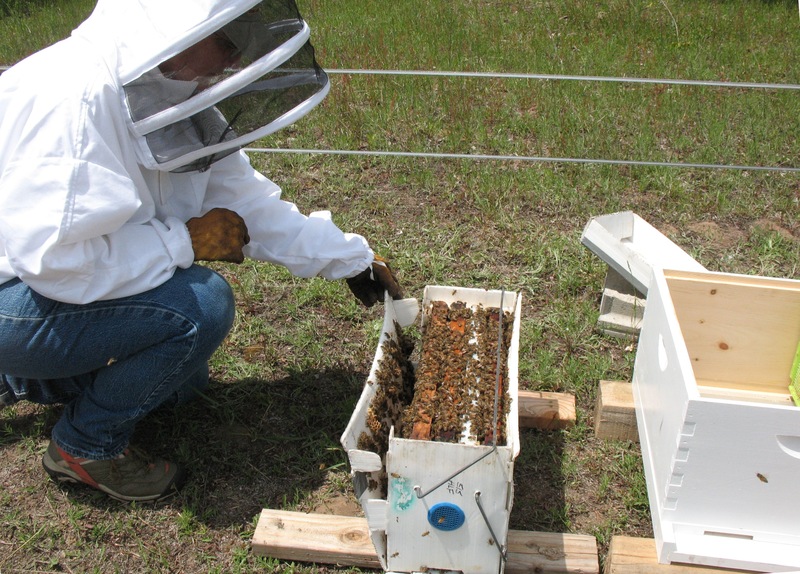 The challenges of beekeeping are a microcosm of the challenges we have in agriculture, anyway. It’s a problem of scale—diversity equals strength—monoculture equals weakness. The solution isn’t to pour on chemicals; the solution is to grow our crops and our bees in ways mindful of, and taking full advantage of, the rhythms and ways of nature. Organics. It can be done. So this week, Rick and I have started to make our contribution to save the bees. A month ago, I took a beekeeping class. And we’ve invested in hives and beekeeping gear. Ours will be pampered bees. They will live in one place. They will have a natural and diverse diet—and in the winter, they’ll eat their honey, like bees should. We’ll enjoy smaller yields in the spring—after the bees have had the chance to overwinter. Small scale, “bees first”, management is the solution. We’ll do our bit to save the bees, while the bees earn their keep by pollinating our gardens and giving up a bit of honey. Win-win. 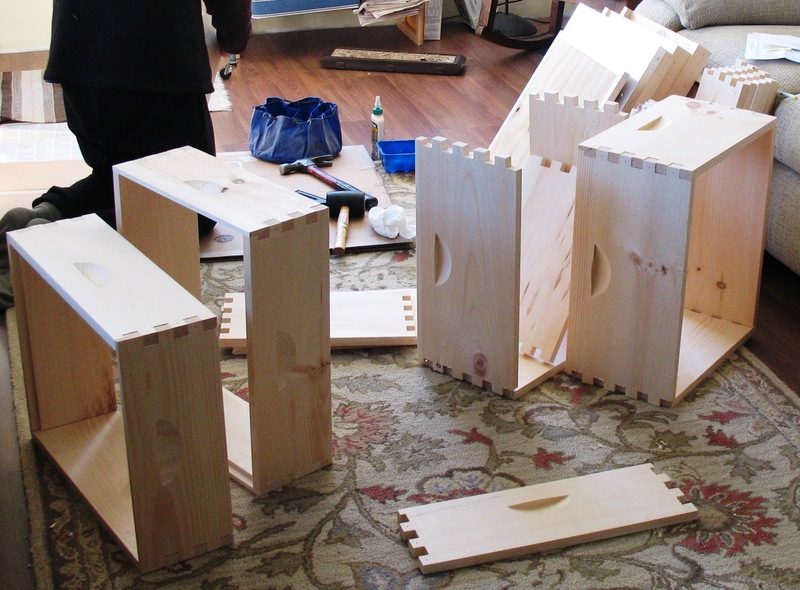 And now, if we could just get these hives assembled…. Let’s see, Tab A….goes into….